Home » Categories » Manage your Finance » More Trips Abroad with a Multi-Currency Forex Travel Card! 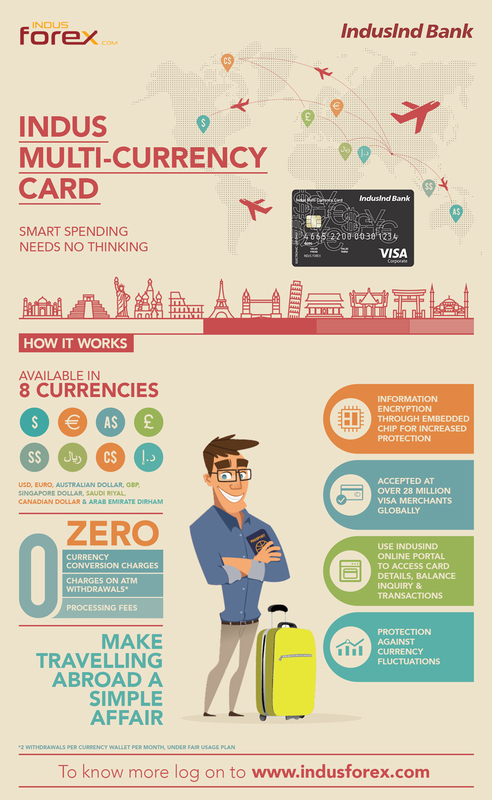 More Trips Abroad with a Multi-Currency Forex Travel Card! Thanks to technology and globalisation, travelling to distant lands for work as well as leisure is fairly easy in today’s times. With about 65 million passport holders in the country, India is pretty active on the international travel scene. According to a survey, an average of INR 2,55,100 was spent during travels by Indians in 2015, only 40% of which was on business trips. With regards to holidays, Indians are opting for international travel destinations at a greater frequency. The destinations most preferred by Indian travellers include Dubai, Bangkok, Singapore, Paris, and London. As more and more Indians are travelling abroad for business and holidays, it is expected that the outbound tourism of the country will cross US$ 40 billion by 2020. Even for an estimate, this figure includes quite an increase in the spending behaviour of Indians when they travel abroad. Travelling abroad has always entailed with it the necessity of carrying sufficient amount of foreign currency. It required keeping a constant track of the fluctuating exchange rates and the depleting reserves of the cash-at-hand. You also had to ensure that you have sufficient cash on your person to avoid any problematic scenarios regarding foreign currency prior to the travel. Such issues however are a thing of the past with the introduction of multi-currency forex cards. Functioning like any other plastic money, allowing one to make swift transactions on the go, they make managing multiple currencies during international travels exceedingly easier. With the Multi-Currency Travel Card from IndusInd Bank, customers have the ease of travelling abroad without having to worry about carrying multiple currencies in cash. This card offers customers eight of the most widely used currencies in the world – US Dollar, Euro, Australian Dollar, Great Britain Pound, Singapore Dollar, Saudi Riyal, Canadian Dollar and UAE Dirham. The IndusInd Multi-Currency card, once purchased, can be used for a range of transactions – exploring tourist attractions, shopping, dining, among much more. The card can also be re-loaded multiple times when the existing amount gets depleted. With a multi-currency card, the benefits are plenty. Convenience and clarity are ever-present features – every transaction incurred while travelling is reflected in the card statement. Unlike normal credit cards, there are no transaction fees involved. Additionally, a key benefit of purchasing a multi-currency forex card from IndusInd Bank is that there are no hassles of dealing with fluctuating currency rates. The rate of exchange remains fixed to what was applied on the day of purchasing the card. Customers receive zero currency conversion charges, zero charges on ATM withdrawals (which is limited to two withdrawals per currency) and zero processing fees. IndusInd Bank’s Forex travel card is designed for a seamless experience. The card can be utilized for secure online transactions, and is accepted everywhere with VISA credit and debit facilities. Users can keep a track of their transactions securely via the IndusInd Bank website. For an added security measure, the Multi-Currency Forex Card is embedded with an encrypted, high-security chip that protects the user from instances of fraud and counterfeit. Obtaining the IndusInd Bank Multi-Currency Forex Card is a simple process that can be done through the IndusInd Bank’s website. You merely have to select your currencies, the amount of cash required, fill out the necessary details and provide the pertinent documents online. Post this, one can select the method of delivery, and book the exchange rate online by paying a token amount and the remainder of the amount upon receiving the card. With such numerous benefits, IndusInd Bank’s Multi-Currency Card is the perfect choice for international travellers who are looking for a simple and seamless method of carrying foreign currency. Get one at the earliest to save yourself from worrying about cash on your next foreign trip.